So close yet so far is what you would probably describe them. These balls are just across one another on air and yet they seem far especially if you were not able to help them meet again. Well, now you can! 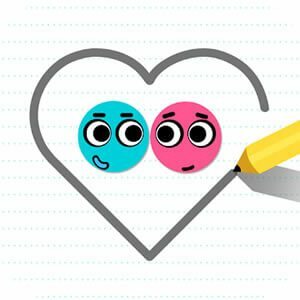 Read more on how you will solve level 72 of Love Balls. If you still don’t have this game, you can download Love Balls on your PC now! Love Balls is a puzzle game with the aim to help the blue and pink balls to meet again. Who wouldn’t want to help them find each other, right? So, go ahead and help them by drawing a line to build a platform or to create a way for them to finally reunite. Heads up! This game needs a thinking brain and an imagination to get you through each level. Learn more about how we solved level 72 below. In this level, the set-up is completely different from the previous level. This time, two huge inverted triangles are placed just below the two balls and are placed in a beam. These triangles are colored yellow which means that once you started the game, they will move. With that in mind, you have to be careful and observe how these two triangles will move. In this case, since the triangles are inverted, both of them fall inside, creating a valley in between them. This could mean that you could just draw a line to catch them both. Like any other level, level 60 has more than one way of solving the game. For this one, you need to either draw a semi-circle that would catch both balls or you just draw a line that could also catch them. The only danger with that is if they did not roll towards each other, which means you’d have to push one of them towards the other. Other than that, you’re good to go! Wait there’s more! You can also check out the solution for other levels. Perhaps, you want to improve your gameplay and take that 2-star level to 3 stars! Check out our Love Balls Level 60 guide!